Family planning in India is based on efforts largely sponsored by the Indian government. In the 1965-2009 period, contraceptive usage has more than tripled (from 13% of married women in 1970 to 48% in 2009) and the fertility rate has more than halved (from 5.7 in 1966 to 2.4 in 2012), but the national fertility rate is still high enough to cause long-term population growth. India adds up to 1,000,000 people to its population every 20 days. Low female literacy levels and the lack of widespread availability of birth-control methods is hampering the use of contraception in India. Awareness of contraception is near-universal among married women in India. However, the vast majority of married Indians (76% in a 2009 study) reported significant problems in accessing a choice of contraceptive methods. In 2009, 48.4% of married women were estimated to use a contraceptive method, i.e. more than half of all married women did not. About three-fourths of these were using female sterilisation, which is by far the most prevalent birth-control method in India. Condoms, at a mere 3%, were the next most prevalent method. Meghalaya, at 20%, had the lowest usage of contraception among all Indian states. Bihar and Uttar Pradesh were the other two states that reported usage below 30%. Comparative studies have indicated that increased female literacy is correlated strongly with a decline in fertility. Studies have indicated that female literacy levels are an independent strong predictor of the use of contraception, even when women do not otherwise have economic independence. Female literacy levels in India may be the primary factor that help in population stabilisation, but they are improving relatively slowly: a 1990 study estimated that it would take until 2060 for India to achieve universal literacy at the current rate of progress. The Ministry of Health and Family Welfare is the government unit responsible for formulating and executing family planning related government plans in India. 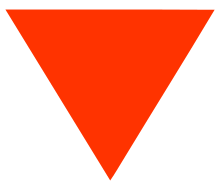 An inverted Red Triangle is the symbol for family planning health and contraception services in India. Raghunath Dhondo Karve published a Marathi magazine Samaj Swasthya (समाजस्वास्थ्य) starting from July 1927 until 1953. In it, he continually discussed issues of society's well being through population control through use of contraceptives so as prevent unwanted pregnancies and induced abortions. He proposed that the Indian Government should take up a population control programme, but was met with opposition. Mahatma Gandhi was the main opponent of birth control because he believed that self-control is the best contraceptive. However Periyar's views were strikingly different from that of Gandhi. He saw birth control as a means for women to control their own lives. Right from the beginning India's family planning programme has been marred by a "vertical approach" rather than working on the factors affecting population growth such as poverty, education, public health care. Owing to the foreign aid flowing in for the family planning programmes, there has always been a foreign intervention in designing the family planning programmes in India without assessing the actual socio-economic conditions of the country. In the early 1970s, Indira Gandhi, Prime Minister of India, had implemented a forced sterilisation programme, but failed. Officially, men with two children or more had to submit to sterilisation, but many unmarried young men, political opponents and ignorant, poor men were also believed to have been sterilised. This programme is still remembered and criticised in India, and is blamed for creating a public aversion to family planning, which hampered Government programmes for decades. After emergency the focus of family planning programme shifted to women as sterilising men proved to be politically expensive. Contraceptive usage has been rising gradually in India. In 1970, 13% of married women used modern contraceptive methods, which rose to 35% by 1997 and 48% by 2009. The national family planning programme was launched in 1951, and was the world's first governmental population stabilisation programme. By 1996, the programme had been estimated to have averted 16.8 crore births. India suffers from the problem of overpopulation. Although the fertility rate (average number of children born per woman during her lifetime) in India has been declining, it has not reached replacement rate yet. The replacement rate is defined as the total fertility rate at which newborn girls would have an average of exactly one daughter over their lifetimes. In more familiar terms, women have just enough babies to replace themselves. Factoring in infant mortality, the replacement rate is approximately 2.1 in most industrialised nations and about 2.5 in developing nations (due to higher mortality). Discounting immigration and population momentum effects, a nation that crosses below the replacement rate is on the path to population stabilisation and, eventually, population reduction. The fertility rate in India has been in long-term decline, and had more than halved in the 1960-2009 period. From 5.7 in 1966, it declined to 3.3 by 1997 and 2.7 in 2009. Seven Indian states have dipped below the 2.1 replacement rate level and are no longer contributing to Indian population growth - Andhra Pradesh, Goa, Tamil Nadu, Himachal Pradesh, Kerala, Punjab and Sikkim. Four Indian states have fertility rates above 3.5 - Bihar, Uttar Pradesh, Meghalaya and Nagaland. Of these, Bihar has a fertility rate of 4.0, the highest of any Indian state. For detailed state figures and rankings, see Indian states ranking by fertility rate. In 2009, India had a lower estimated fertility rate than Pakistan and Bangladesh, but a higher fertility rate than China, Iran, Myanmar and Sri Lanka. ↑ Rabindra Nath Pati (2003). Socio-cultural dimensions of reproductive child health. APH Publishing. p. 51. ISBN 978-81-7648-510-4. ↑ "Manas: History and Politics, Indira Gandhi". Sscnet.ucla.edu. Retrieved 2012-08-03. ↑ "Internet Archive Wayback Machine". Web.archive.org. 2009-10-27. Archived from the original on 27 October 2009. Retrieved 2012-08-03. ↑ "Over-population warning as India's billionth baby is born". The Guardian. London. 2000-05-11. Retrieved 2010-05-02.